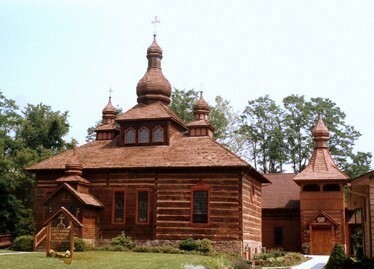 Holy Cross is the only Orthodox parish in northcentral Pennsylvania serving Lycoming and surrounding counties. Parish families live in Williamsport, Lewisburg, Muncy, Montgomery, Montoursville, Jersey Shore, and Lock Haven areas. The area is serviced by the Lycoming County Airport in Montoursville and regular bus service. The Church is easily accessible. It is located 2 blocks north off the Faxon Exit of I-180 (off Northway Rd), about 100 yards on the left after the second traffic signal. 5:00 PM Vespers, followed by Orthodoxy 101. Private confessions are available at any time by appointment and before/after Vespers. Call the office at 570-322-3020 for schedule updates and special services. Holy Cross was established as a mission station in 1977 when a small group of Orthodox faithful living in the area “found each other”. They petitioned the Diocese of Eastern Pennsylvania to hold services in a local high school. Diocesan priests provided service until the assignment of +Fr John Kozak in February, 1978 as the first resident priest. Fr Daniel Kovalak was assigned to the mission (coming from Miami, FL) in September 1978. Two months later, the community was given the name of “The Elevation of the Holy Cross” at a special service. They continued to meet at various local churches with a regular cycle of services. In 1979, the current parcel of property (then vacant) was purchased. Obtaining a bank loan (with some difficulty! ), a combination rectory/chapel was constructed and was occupied by Palm Sunday, March 30, 1980. A full parish life ensued. Often, the community’s growth was stunted with numerous relocations of parishioners away from the area for employment considerations. The ultimate vision of building a church remained a goal during the early years of struggle. Experiencing significant growth, blessed with dedicated fund-raising efforts of parishioners, and ambitious leadership, and inspired by a “work-and-pray” attitude, the mission began to develop the strategy to accomplish its vision in 1986. Building plans were generated for a log structure (Williamsport was the log capital of the world in the 19th century). On November 2, 1986, the community unanimously (and enthusiastically) adopted the project and rolled up their sleeves to execute the plan. On May 17, 1987, the mission observed “Super Sunday”; simultaneously burning the mortgage on the property and breaking ground for the new church. Over the next 17 months, work crews of parishioners and “friends” joined the pastor in the nitty-gritty tasks of construction under the leadership of masterbuilder Paul Beard. The Auxiliary provided meals for the crews. During the two hottest Summers of the century and a bitter Winter, workers worked….hard! The basic structure of the church is an 180-year-old hand-hewn log barn, painstakingly dismantled, cleaned, transported (from five miles away) and reassembled on site. The distinctive cupolas were executed within the structure and hoisted into place. Various appointments were discovered from numerous sources that enhanced the building-in-progress to conform to “God’s design”. This project was accomplished without a mortgage. Parishioner loans and generous financial support to this unique project satisfied construction costs. The new church, now a full-fledged parish, was formally consecrated to the glory of God on November 12, 1988 by Bishop Herman. Within the altar table were sealed the relics of the Greatmartyr Catherine of Alexandria (+305) to whom the parish has grown especially close through the years. The church basement (parish center) was completed—again by parishioners—during Holy Week, 1989. Subsequently, the former chapel was renovated to house the parish office and 2 classrooms, and the driveway and parking area expanded and paved. The sign which identifies the building was added in 1991. The church is one of the most unique structures in Pennsylvania and has generated great interest. Architectural classes from the local colleges regularly visit. Photographers and tourists come by the dozens. Parishioner and neighborhood guests invariably schedule a visit. And international tourists appear especially during the annual Little League World Series held in August. The parish is currently in the process of constructing a fellowship center. Holy Cross Church welcomes people of all national backgrounds. Services are conducted in English with congregational singing. A recent parish profile revelaed some 40% of current membership consists of converts to the Orthodox faith, many of them being drawn to investigate Orthodoxy through various parish outreach ministries. The parish also includes a majority of young families with small children (its Tikes Church School class having the largest enrollment). The parish is supported by a financial pledge system and monthly projects. A genuine spirit of Christian Charity is predominant as the parish generously supports many local, national, and international efforts, both humanitarian and church-related. The established parish vision is “to practice Orthodox Christianity and lead others to it.” Personal evangelism is emphasized for the building up of the Body of Christ. The Gospel and the story of Pentecost speak of ‘fishers of men’, drawing people into the Church - the ‘net’ of Christ. Through this technologically-updated version, we pray that you and yours will be drawn into the ‘web’ of Christ! God Bless!